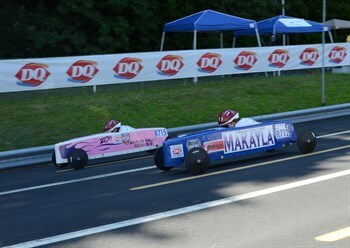 The Rally Challenge became part of the FirstEnergy All-American Soap Box Derby in 2013. The event takes place during race-week and only Rally Champs are eligible to compete. The event is a single elimination, three phase race where champs race in all three lanes, swapping wheels after each phase from a special wheel bank. The Champ with the best time after three phases advances to the next round of competition. Three Champions will be crowned and they will receive their trophies at the FirstEnergy All-American Soap Box Derby Awards Ceremony on Saturday, July 20 at 7 p.m. at the Akron Civic Theatre. Stock - Kirsten Hull, Carmel, Ind. Masters - Sean Brown, Spotsylvania, Va.
Stock - Evan Maves, Middleton, Wis.
Super Stock - Marisa Locastro, Auburn, N.Y.
Stock - Julia Irving, Lexington, Mass.